I will be the first to admit that planning beyond tomorrow just seems impossible these days. I have friends who are making plans for the Christmas holidays while I am still trying to enjoy the end of summer. And even though I don’t have a clue where my family is headed for Thanksgiving – I do know that Blurb has a ‘Thank You’ Sale going on right now. It is time to download your favorite summer pictures from your cell phone and create some fun photo books to give to your favorite family and friends as a little special thank you gift this holiday. Add a few special words including a special memory or a simple note of thanks to complete your custom photo book. Another fun idea would be to collect a bunch of your family’s favorite Thanksgiving recipes and include a few crazy pictures of your cousins and grandparents and create a keepsake everyone will treasure for generations to come. Make your books (hard copy or electronic) this weekend so you can take advantage of this special Thank You promotion and you can cross one more thing off of your to-do list. Enjoy 15% OFF your order now through Monday, September 9th, 2013. Oh wait – I almost forgot – the promo code you will want to enter is TAKE15. Let me know what kind of book you end up making! A month ago I stumbled upon a company called, flattenme, and I was immediately intrigued. I just loved the unique name and was so curious to find out what they did. (Evidently I was a little late to the party as Orpah and team have already featured flattenme’s products in one of her gift guides. At least I know I am in good company…) When I checked out their site I read a fabulous story about how the idea for the business came to be and I loved their focus on imagination, inspiration and gifts of the heart. I knew this would be a perfect company to feature on Sweet Peas & Stilettos. Owl Always Love You Carl arrived in the mail a few days ago. It is written by Robyn Spizman and illustrated by Erica Leighton. After my son’s bath, when he curled up on the couch in his favorite blue stripped Hanna Anderson pajamas, I pulled out the book as a little surprise. His eyes lit up when he saw his name on the cover. “How did you do that Mommy?” It was a sweet bedtime story that was perfect for my 6 year old. With every turn of the page, he heard me read his name and he smiled in delight. JULY GIVEAWAY – If you want to WIN a FREE copy of Owl Always Love You that you can customize for your own child, simply let me know on Twitter or Facebook (see icons on top right of page). The winner will be randomly selected from entries and will be notified on July 31, 2013 after 12 noon, PST. Please note, the book if free and you will only be responsible for a nominal shipping charge. I want to personally thank the team at flattenme for my copy of the book and for sponsoring this giveaway! Celebrate Minted’s anniversary with 15% off everything. Anyone who has visited Sweet Peas & Stilettos knows how much I LOVE all of the products at Minted. I am so thrilled for their success and I bet the next 5 years will be full of even more creative and colorful treats for all of us. 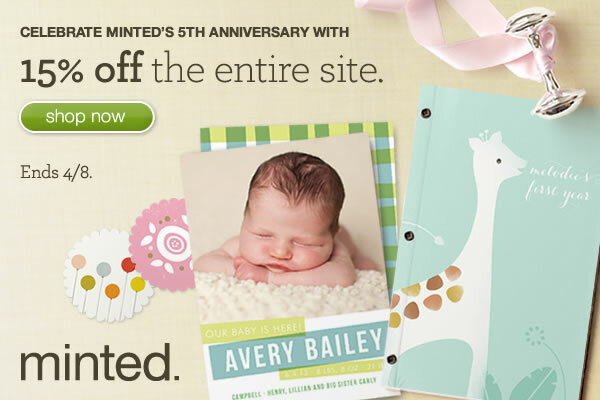 Happy Anniversary Minted! Now we can all celebrate. Fabulous sale alert! Starting today, through Wednesday, February 27th, Tea Collection (one of Sweet Peas & Stilettos’ favorite partners) is offering you the chance to buy 3 separates and get the 4th one free on select styles with promo code 4FUN. Just look for the 3+1 icon for participating styles. Stock up on comfortable and durable pants and cool t-shirts for boys. Mix and match adorable girls’ tops and bottoms for endless outfit combinations. A little tip – A number of favorites from the South Africa selection (that your kids will ove) are included in the sale. It is a perfect opportunity to stock up on colorful basics for spring and summer. Don’t miss your chance to take advantage of this amazing sale from Tea Collection! Happy Shopping & Happy Saving too! I have always thought it would be so fun to work at Tea Collection and travel all over the world to find inspiration for their upcoming collections. I envision it as nothing but a creative adventure, but I know they must work really really hard. I am always excited to see what country or continent they have picked out. Since I have always wanted to visit South Africa, I was thrilled to see that South Africa was the inspiration for their latest collection. And it gets better, because from now through Valentine’s Day, 2/14/13, Tea Collection is offering 15% off sitewide with promo code GOTHERE15. You can shop the hottest spring looks inspired by Tea Collection’s travels to South Africa or take an additional 15% off already reduced sale items. Spring will be here before you know it so it is a great time to stock up for the sunshine. Hurry, don’t miss your chance to shop this great sale from Tea. Happy Shopping! I don’t know about you, but after the holidays I am totally ready to clean the house and get organized. The first place I am going to start is my son’s closet. And this time I am going to try using a brand new company called Spruceling to help me de-clutter, make a few bucks and help others too. Have you ever taken clothes to a consignment store? It is nice to get rid of things and clean out your closet but I found that I hardly got any money, and the money I did make was spent on gas to drop off the items and to go pick up the ones that didn’t sell. And it is never fun to have a stranger inspecting all of your clothes and telling you that the $75 dollar sweater your son wore once (for about 7 minutes) just wasn’t good enough. Uggh – never again! Spruceling is great because it is all online so you can do your selling and shopping any time of the day or night. For sellers, they make it easy with free shipping labels so it is easy to just drop off your box and go. And they handle all of the returns too so you don’t have to. Best part of all, you get a full 60% of the sale instead of the typical 25-35%. And for buyers, of course you get the perk of saving money (who doesn’t love that?) and not having to walk into a mall with your small children (so not fun!). The other thing that is kind of cool is that you basically purchase a box of items that are all the same size, instead of picking out items one by one. Just like getting a whole new little wardrobe. The interface of the site is super easy to navigate and you simply find a box that has cute things you think you and your child will love. And if you end up not liking the items, there is even a 30 day guarantee. You get to rate the seller too, and Spruceling makes sure that people who try to sell dirty, ripped, or worn out clothes will get a permanent time out. Who has time for someone else’s dirty clothes? So you are probably thinking that there are many options when it comes to selling and buying gently worn kids clothes. Yes that is true. But there is one thing about Spuceling that made me love it – the charitable giving component of its business model. They donate a percentage of all sales to a different children’s charity every month. And for the month of December they are actually donating 100% of their proceeds to St. Jude’s Childrens Hospital. Love that! Despite the wet and windy weekend ahead, I am happy to share at least some good news – Tiny Prints is extending their sitewide sale all weekend long. You can SAVE 25% on just about everything and it looks like you can score FREE shipping too. What a great way to wrap up Tiny Prints week here at Sweet Peas & Stilettos. So go ahead and kick off December with some great holiday deals. As most of you know, they’ve got photo gifts, holiday cards, invites and more. And one little hint – now is a good time to buy thank you notes for the kids so they will be ready to thank friends, relatives and Santa Claus for all of those wonderful holiday gifts.